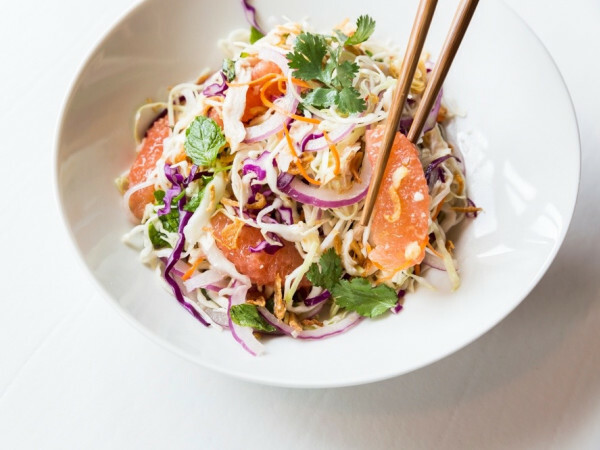 Some restaurants open quietly. They turn on the open sign and people who live in the immediate area wander by to check the place out. 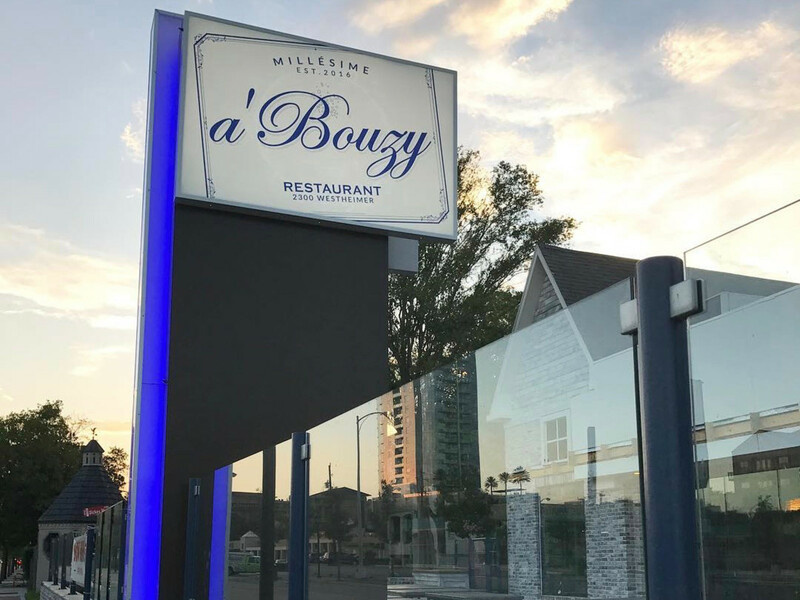 A’Bouzy is not one of those restaurants. 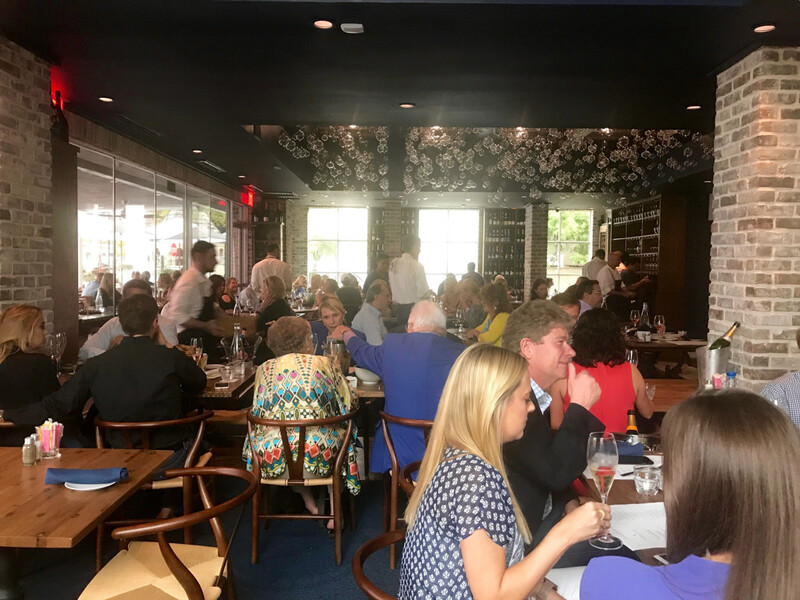 The new project from former Brasserie 19 general manager Shawn Virene made its debut Wednesday night with a packed house as future regulars and restaurant industry veterans flocked to greet the new arrival. The building makes a strong first impression. 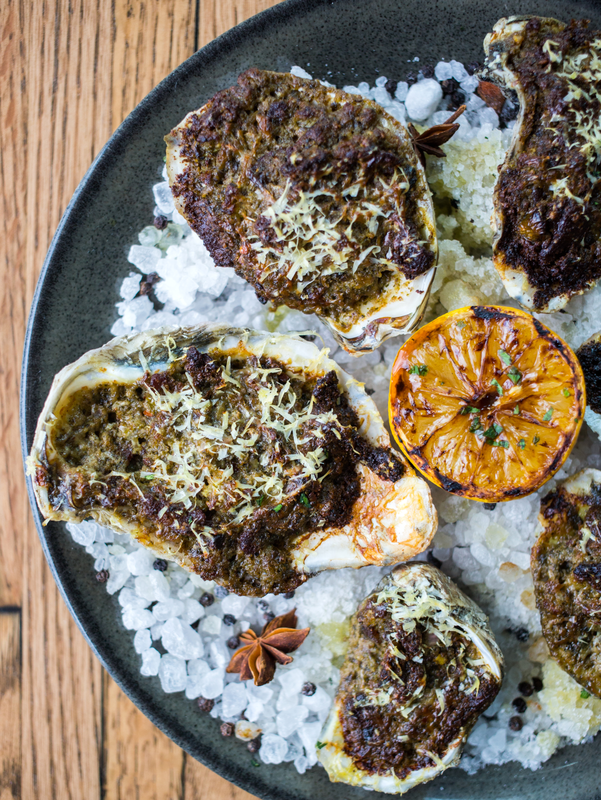 All traces of the ranch-inspired decor from the 60 Degrees Mastercrafted/Harwood Grill days has been obliterated in favor of a French-country theme with brick columns, blue-painted wooden floors, and classic wooden tables and chairs. Moving the entrance to the east side means the bar now occupies the space that once served as the private dining room. 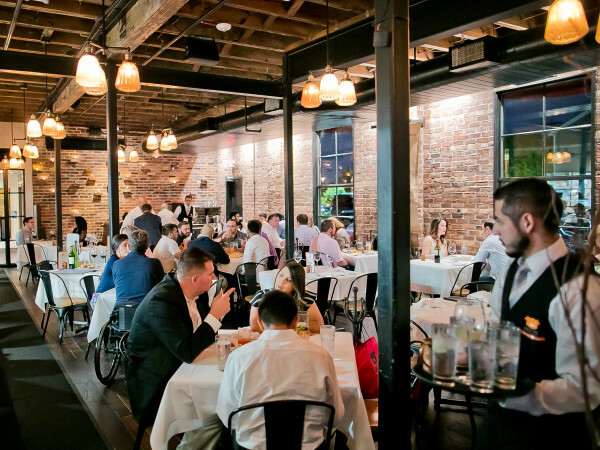 Virene built a cover for the restaurant’s expansive patio, which gave it some utility on Wednesday night despite the rain. Two design features dominate the dining room. A glassed-in raw bar displays both the day’s oysters (and the men shucking them) and a leg of Spanish ham (jamon iberico priced at $19 per ounce). 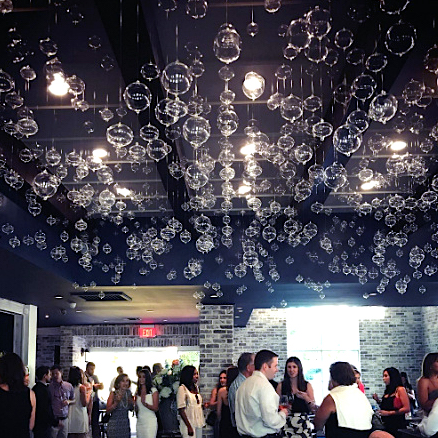 To emphasize the restaurant’s champagne-oriented nature, hundreds of glass bubbles fill the ceiling. 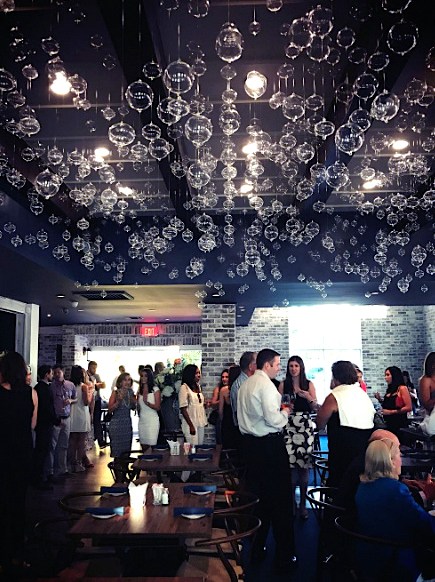 We spotted a number of familiar faces in the crowd, including Erica Rose, Judge Alix Smoots-Thomas, Sara Leighton, Debbie and Rudy Festari, John Rinando, Magen Pastor, Chris Amez, and Sapna Patel Gupta and Arpan Gupta, who were celebrating her birthday. 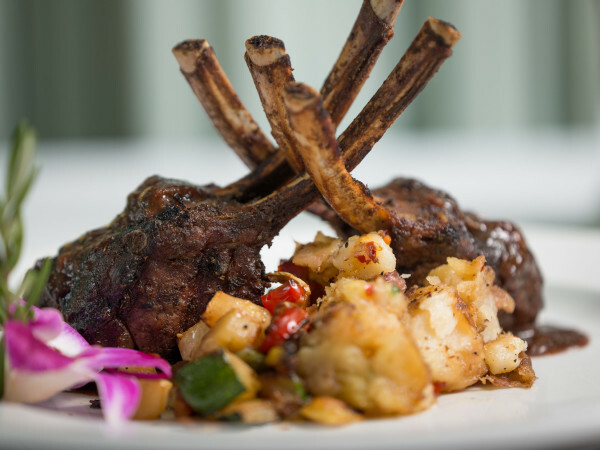 From the restaurant industry side, Shepard Ross and the Pucha brothers got a feel for what this fall’s opening of Maison Pucha Bistro might feel like as they dined at a center table. Isaac Johnson (Weights + Measures), Mary Clarkson (L’Olivier), Margie Krause (Brennan’s), and Shaun Sharma (Dirt Bar) also stopped by to check out the new arrival. 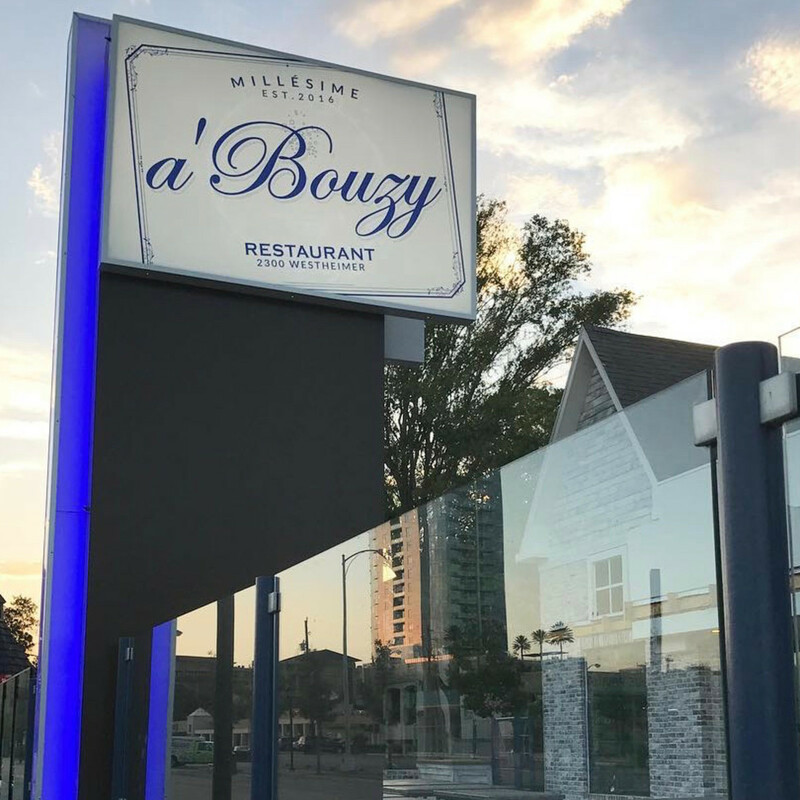 Shouts of “A’Bouzy” could be heard each time a server opened a bottle of champagne. 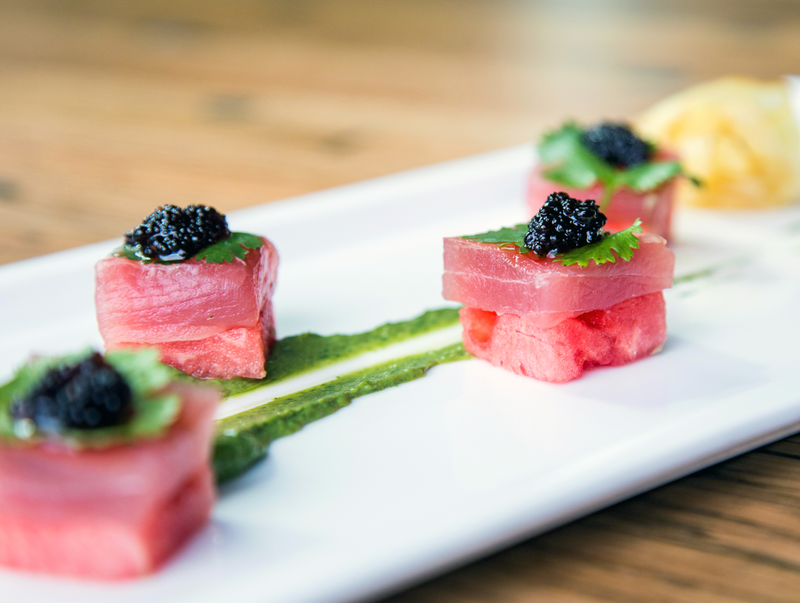 Virene has marked up his 250 sparklers at just one-and-a-quarter times his cost, which is below the standard retail markup, wine writer Jeremy Parzen notes. Why not get a bottle when Delamotte is only $44 (even cheaper than Veuve Clicquot “Yellow Label”) and Ruinart is $62? 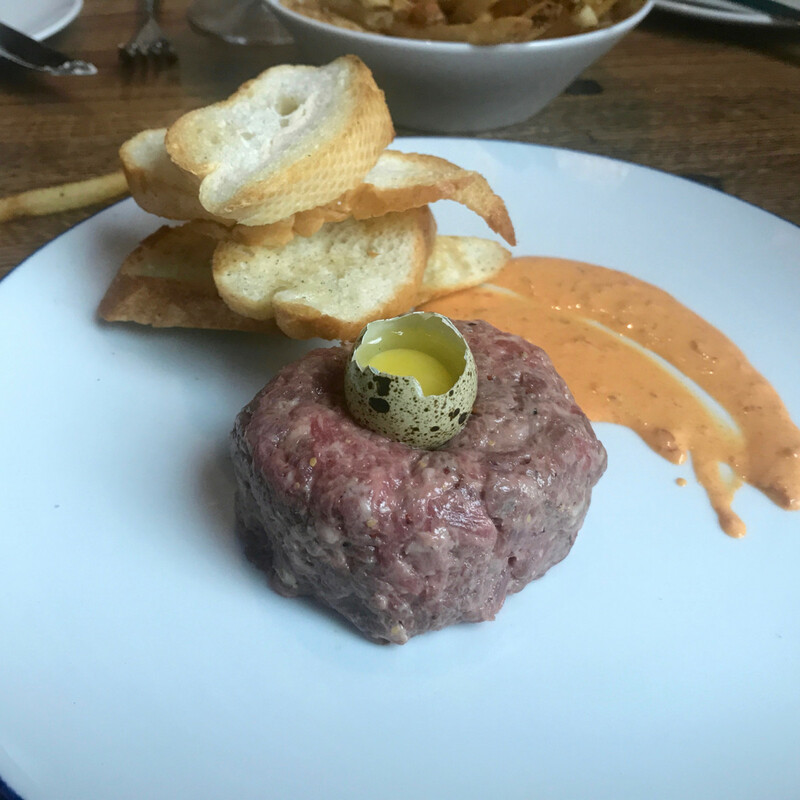 In addition to knocking down a couple of bottles of bubbles, three friends and I also sampled a few of the restaurant’s small plates. 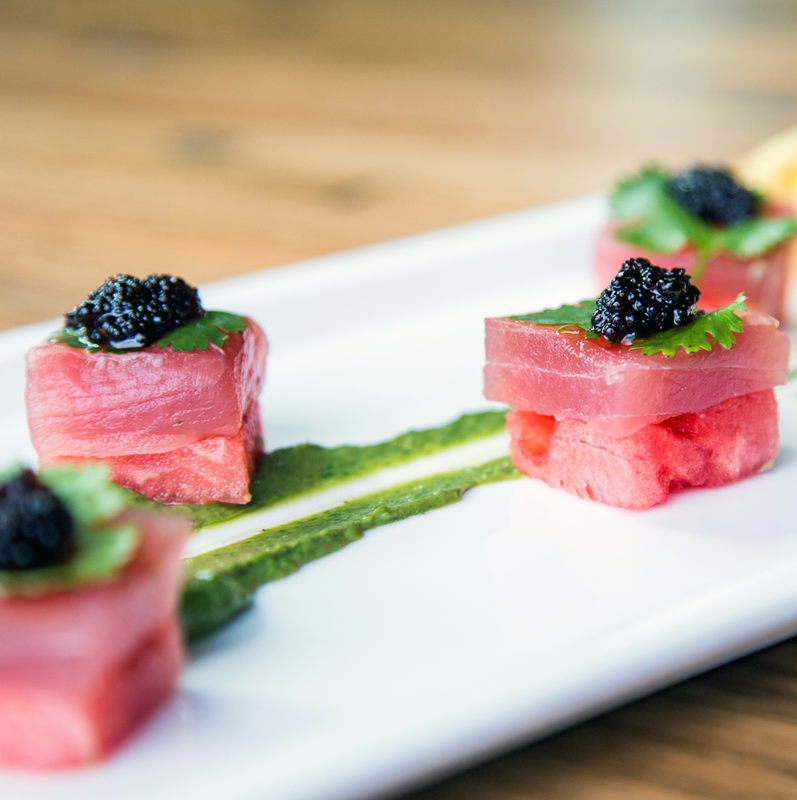 Our favorites included the tuna watermelon sashimi, which balances the watermelon’s sweetness with a salty pop from soy caviar, duck fat-fried pommes frites, and baked oysters topped with a lively mix of pesto, bacon, and parmesan. 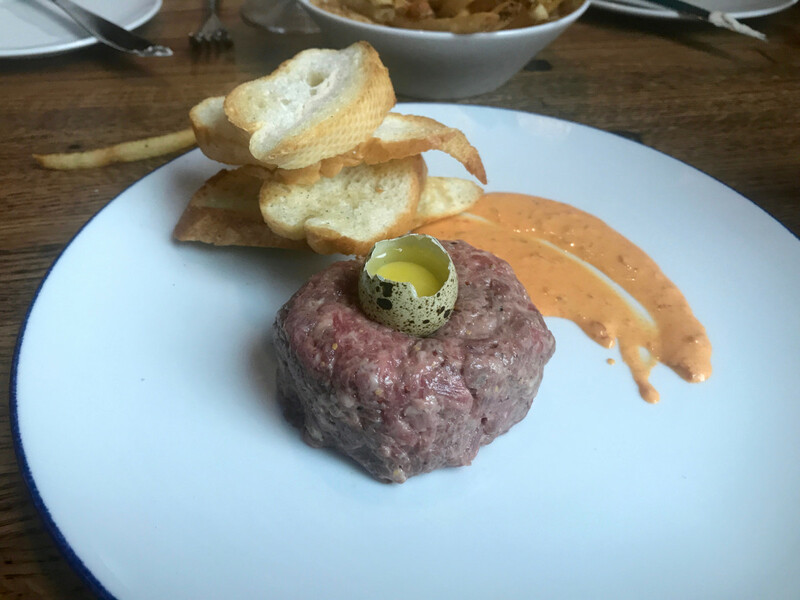 Steak tartare kept things classic with a quail egg and dijon mustard. 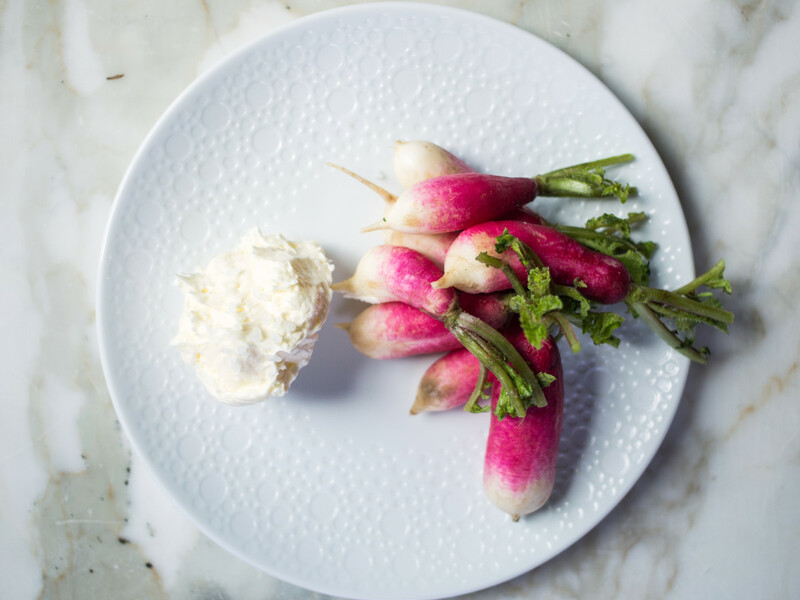 We didn’t try the burrata, but its presentation with a bright red roasted tomato makes a strong impression as it moves through the dining room. While it’s hard to fault a kitchen on its first night, the braised meatballs in a lively tomatillo salsa would have benefitted from a hard sear to improve their texture. Looking around the dining room, it seemed as though most tables adopted the same approach. 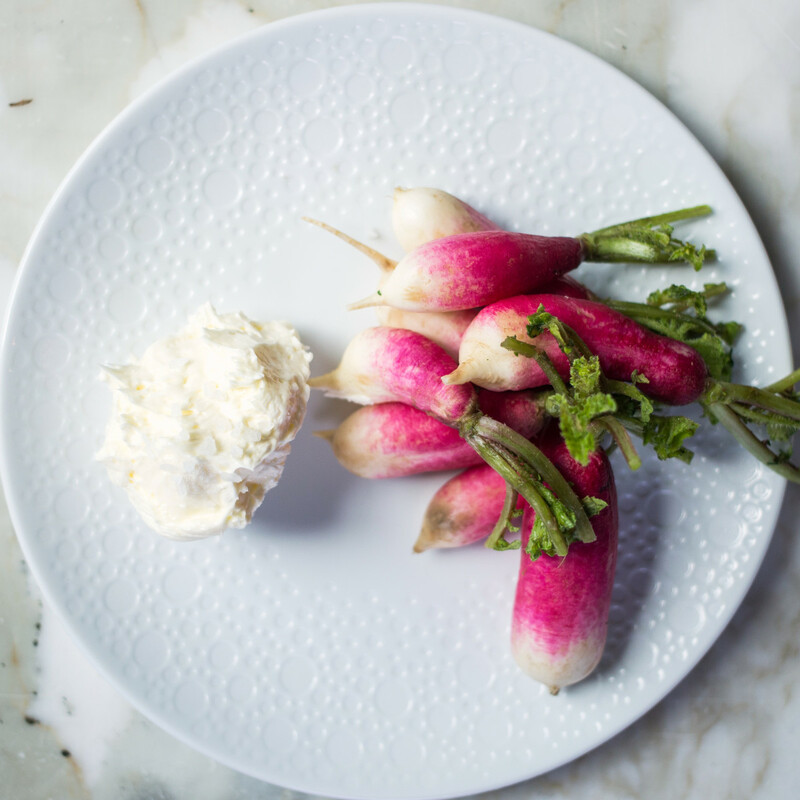 Order a few apps for the table to pair with a bottle of champagne and then split an entree or two (along with more wine); we opted for the lemon sole which arrived well-prepared with a firm texture and welcome accompaniments of parsnip puree and green beans. By 8:30 (we’d ordered a third bottle of wine), a younger crowd started to arrive. Lexus and Mercedes sedans got swapped out for black G-Wagons and a white Lamborghini. 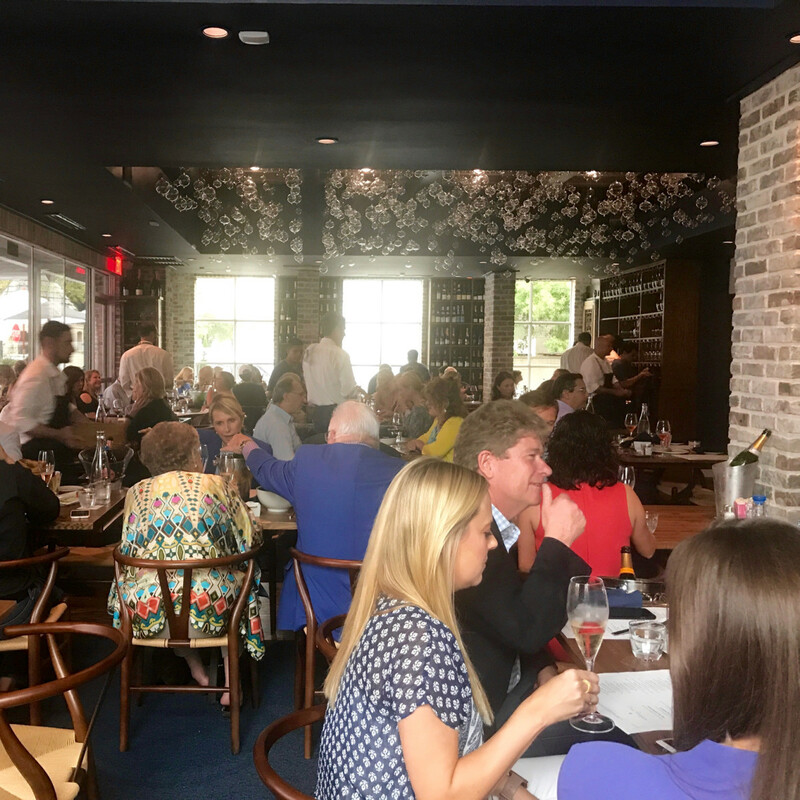 The bar that seemed downright spacious at 5 had overflowed into the dining room, requiring servers carrying trays full of glasses to bob and weave to avoid dropping their precious cargo. Despite the chaos, the staff stayed sharp all night. Virene, his wife Shelly, and manager Jonathan Bradbury managed to touch every table. 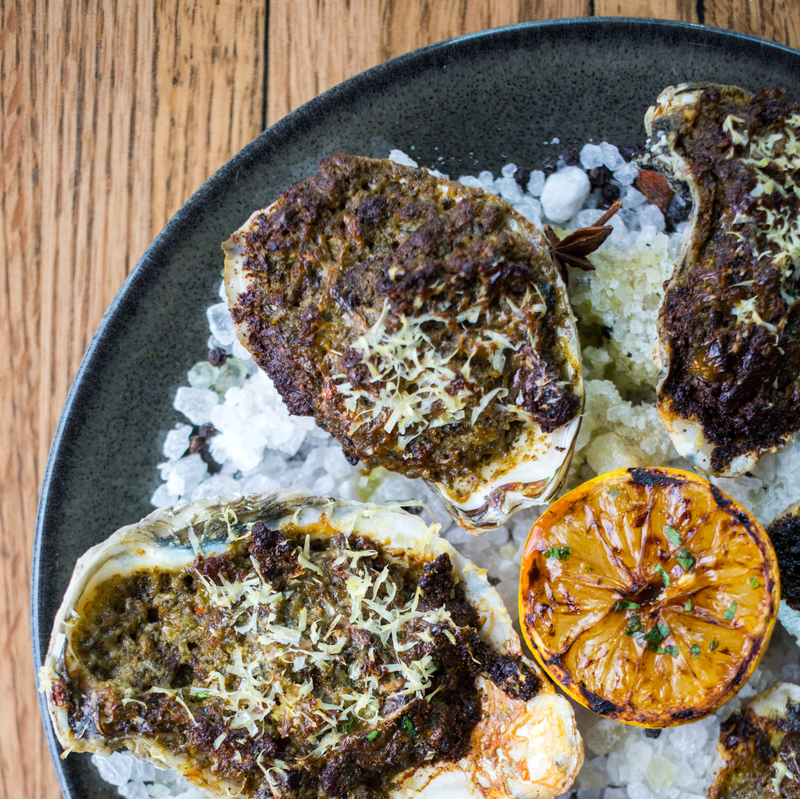 Those personal touches will serve A’Bouzy well if it wants to achieve its aim of becoming the city’s newest hotspot.